Jeri Smith-Ready: Two LUST FOR LIFE guest blogs/giveaways for the price of one! Two LUST FOR LIFE guest blogs/giveaways for the price of one! Okay, technically they're both free, except for the time it takes you to read them, and it will take you twice as long to read two posts as it takes you to read one and twice as long to enter two giveaways as it takes you to enter one. So really it's just two guest blogs/giveaways for the price of one of THESE blog posts. Which is convenient, since I have a Girlfriends Cyber Circuit interview to post this week as well (Eileen Cook's The Almost Truth, which looks awesome!). The prize at both of these blogs is your choice of WVMP RADIO novels, signed and personalized by me! The posts are to celebrate this week's release of Lust for Life, but if you're new to the series, these giveaways will give you a chance to start at the beginning (which, I hear, is a very fine place to start). 1. 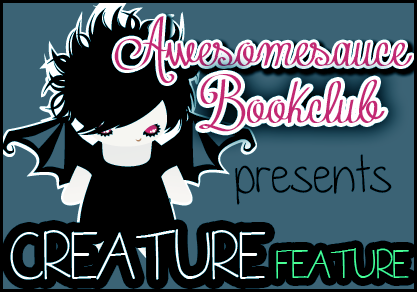 Amber at Awesomesauce Book Blog interviewed both Shane and Regina for their regular Creature Feature. This was Regina's first interview ever. Big shocker: they didn't agree on everything (though they did agree on which musician they would vamp--check the comments to find out). Sidenote: I love how the Creature Feature logo over there sort of looks like Regina in a bad mood. Which is to say, it looks like Regina. To Enter: Read the interview and ask Regina and/or Shane a question in the comments. International entries welcome, but per the blogger's rules, this contest is open only to readers 18 and older. Deadline: December 5. 2. Shane, all by his lonesome, wrote a 90s-music post over at Two Chicks on Books. He discusses a song that came out right after he was vamped in 1995, a song he loves but realizes was awfully, awfully bad for him. To enter: read the post and answer one or both of Shane's questions about your favorite songs (one question is worth extra entries for making you think and stuff). International entries welcome. Deadline: December 6.